A more robust, two ply high temperature service duct. Two plies high temperature resistant coated fabric offers a longer service life. Material: Alumina coated, textile glass fabric reinforced with fine V4A wire. (also available stainless steel helix). Diameters: 4” to 24” I.D. Larger sizes available. Weight: 6” I.D. =2.01 lbs/ft. Temperature range: -200°F to +1500°F. Intermittent. 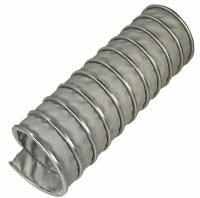 The life of all fabric ducts can be greatly extended when sized correctly according to equipment exhaust requirements. When exhaust fume leakage is of a concern a negative pressure fan system should be incorporated. Please consult a Novaflex factory salesperson for correct sizing for diesel, caustic or high velocity exhaust applications. 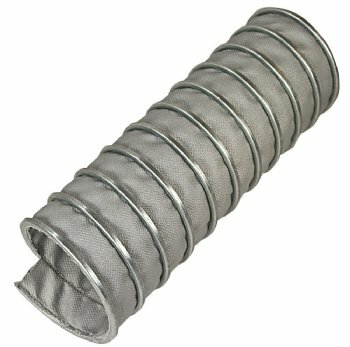 This will aid in reducing exhaust temperatures and static pressures. Diesel exhaust particulate can cause abrasion in exhaust applications. The amount of particulate expelled in diesel exhaust can effect the useful service life. Where exhaust fume leakage is of concern a negative pressure fan system should be incorporated.